I love to cook but there are a few things that are my husband’s specialties – meatloaf, chili and Welsh Rabbit. Welsh Rabbit is the ultimate grilled cheese sandwich. Toast up some nice crusty French bread and enjoy. Make some extra cheese sauce, steam some broccoli and you’ve got the perfect side dish. 7 ingredients to make a wonderful cheesy dish. A great way to warm up your cold, gloomy days! In a heavy 2-3 quart saucepan, combine the cheese and flour mixture, beer, butter, Worcestershire, mustard and cayenne. Stir over low heat while the mixture melts and combines. Be careful not to let the mixture boil. 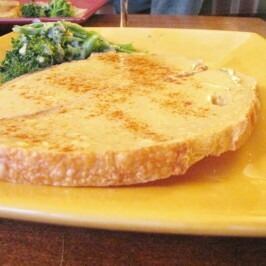 To serve, arrange the toasted French bread on a plate and pour the cheese sauce over. Garnish with a little paprika if you like and dig in. Garlic Scape Pesto – No Nuts!